George: How hostile to religion must the state be? Elmbrook School District v. Doe. The Becket Fund for Religious Liberty (n.d.). Retrieved from https://www.becketlaw.org/case/elmbrook-school-district-v-doe/. Elmbrook School District v. Doe. (Apr. 04, 2019). https://www.becketlaw.org/case/elmbrook-school-district-v-doe/. "Elmbrook School District v. Doe." The Becket Fund for Religious Liberty. Accessed [Apr. 04, 2019]. https://www.becketlaw.org/case/elmbrook-school-district-v-doe/. 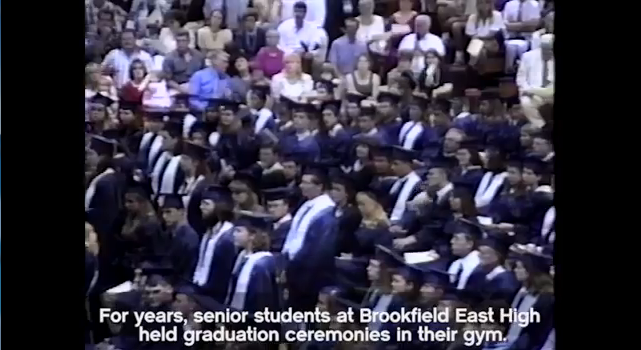 Where would you rather attend your high school graduation: In a hot, sweaty gym? Or in a state-of-the-art church auditorium? For the Elmbrook School District, the question was a no-brainer: It chose the auditorium. The school gym was hot, cramped, and sweaty in the month of June—with no air conditioning, inadequate parking, poor handicapped facilities, and only folding chairs or bleachers for seating. So the senior class proposed moving graduation to a local church auditorium. The auditorium had more space, more parking, better handicapped facilities, and better seating. It had large video screens for close-up viewing. It had air conditioning. And it cost the same as the school gym. The District happily moved graduation to the auditorium, and for the next decade, the students were delighted. Then came the lawsuit. A secularist organization claimed that certain students were “offended” and “angry” at the use of the church auditorium. They admitted that the graduation events were entirely secular, and that no prayers or religious references had ever been made. But they disliked the fact that there was a cross at the front of the auditorium, Bibles and hymnals in the pews, and church brochures in the lobby. That’s when the School District turned to Becket. We knew that the case was important: Hundreds of school districts hold graduations in religious venues, because those venues are often the best and cheapest available. The Constitution does not require school districts to treat religion like a toxic subject that must be avoided. But we also knew that the odds were against us: The U.S. Supreme Court agrees to hear only about 1% of cases that are appealed to it. On December 20, 2012, we appealed to the U.S. Supreme Court. After a year-long delay, the Supreme Court declined to hear the case. But in a strong show of support, Justices Scalia and Thomas dissented, arguing that the lower court had failed to apply the proper legal standards. Becket remains ready to defend the principle that religion is a vital part of human culture—not a toxic subject to be avoided.